This weekend the farmers market was full of fresh field ripened locally grown tomatoes and I picked up a bunch of them. While I was at the grocery store I was thinking about the caprese salad that I had not to long ago when I passed a nice looking loaf of ciabatta; my favorite sandwich bread. 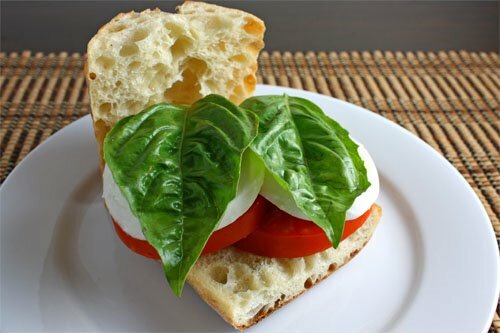 The two thoughts collided and I just had to try a caprese salad sandwich in some nice and crusty and chewy ciabatta. The first version of the sandwich was pretty simple having just fresh tomatoes, mozzarella and basil ant it was nice and fresh and really good. I knew that I would be using a lot of the fresh basil to make some basil pesto and I thought that it would be great if I added some of that to the next sandwich. The fresh basil pesto made the sandwich even better! While on the roll, the next sandwich got a splash of balsamic vinegar which added a really nice kick. My next thought was that it would be really nice if the mozzarella was melted by grilling the sandwich. I had wanted to do it panini style but I do not have a panini maker so I pulled out my grill pan and pressed down on the sandwich with a bowl. The grilled caprese sandwich did not get the nice panini grill marks but the mozzarella did melt nicely. The warm gooey melted mozzarella in the sandwich was really good. I am off to make another sandwich. Grilled caprese panini is definitely one of my fav. sandwiches. There is an Italian cafe on campus that made a really good one and I used to have it at least once a week when I was still in college. Mmm. This looks so yummy! I have never had fresh mozzarella cheese, we are planning on making some from the milk we have from our cow! Can’t wait! Grilled caprese is straight up summer. yum. Make one for me to please! This is my most favorite sandwich, one that I ate often growing up! YUM! The grilled one is definitely my favorite. Oh wow. 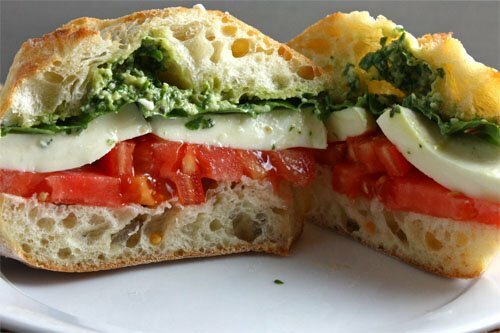 It never occurred to me to put a caprese salad on a sandwich (because I am apparently far from creative), but that looks absolutely amazing, especially with the pesto. I love caprese panini. Your basil looks beautiful. Oooh, such a lovely, classic sandwich. This looks so refreshing! I love those summer tomatoes! That is such a good looking sandwich, very simple and I love the fact that you use pesto for the spread, have you though of just putting balsamic and olive oil? so simply but so tasty! Your sandwich looks so delicious and refreshing! I think it’s perfect with the melty cheese and toasty bread.. even though there aren’t any marks. yumm caprese, i could go for one of these right now. Ahhh, melting the cheese over a nice hot grill is just the way things should be 😉 I love the thick, juicy tomatoes too! your food always look good yet simple! I love a good sandwich! Especially with pesto and melty cheese, this looks delicious! Nothing but the simplest ingredients to make a great sandwich. What a fresh and tasty idea. Looks beautiful as well. Holy freakin’ cow that looks delicious. Looks delicious Kevin and very colourful! OMG, that sandwich looks scrumptious! Refreshing and flavoful! Whenever I visit my mother in law, I go to a little bistro in town, that serves a basil pesto caprese sandwich. It is my all time favorite sandwich. The photos make my mouth water. Wow, keep the new and great ideas flowing! Such a simple sandwich yet so delicious! Looks great. You made a BMT instead of the BLT! I’ll have to try the grilled version, it looks delicious with the cheese melting, yummmmmm! I’m so jealous when I hear fresh produce, tomatoes, farmer’s market! So jealous! This is one of my favourite sandwiches to make Kevin! Looks absolutely delicious. I could just take a big bite now…..
That bread looks perfect for that sandwich, dude. I love the melted mozzarella and those tomatoes look nice and sweet. I was reading this saying to myself, “this would rock with the right application of olive oil and aged balsamic vinegar. And then you did just that! And you grilled it…even better! I love ciabatta bread and the grilled sandwich looks awesome! That looks utterly delicious. I love to make this sandwich to travel with (not grilled) because it keeps so well. “I am off to make another sandwich.” Love it! EAch of those sandwiches look fantastic! Yum! Gorgeous Kevin! A perfect Sandwich in my opinion! I ate so many of these this summer. I got the bread from Whole Foods: a nice sourdough baguette. Your picture is so mouth-watering. I just got a panini maker and this is one of the sandwiches I am dying to make. yumm! yet another delicious recipe and tantalizing picture! great work! 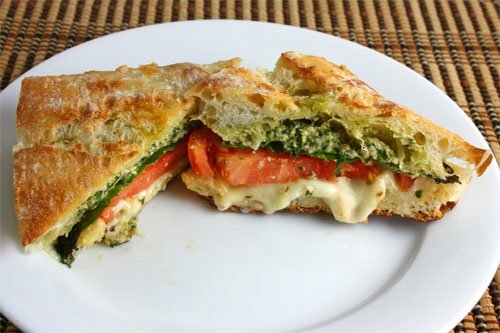 Absolutely love this sandwich, mmm pesto and tomato are perfect together. Why couldn’t I have had THAT for lunch? Wahhhhh……. I love it when great ideas collide! And i also love how your ideas on this one just kept improving what was already delicious, for sure. oooo…can’t wait to try this. I make an appetizer similar to this, the difference is I cut up french baggette into small circles brush them with olive oil and bake with ball moz, basil and tomato. That looks really fresh and yummy! How can a caprese get any better but to be in a panini. Love the addition of additional basily goodness in the pesto. I don’t have a panini press either but I bought a big ol’ brick that I tripled covered in foil…that does the trick. This looks so good! I am dreaming of when I could bite into these slices of sandwich and feel the cheese melt in my mouth…YUM! Your basil is so beautiful and the leaves are so big!!! Lovely sandwich!!! When I saw your first photo I thought to myself it would be very nice with pesto…then voila you made it and then you toasted it!!!!!!!! Everything looks so good — the bread and each of elements inside. So light and satisfying. What a great idea! I think I’d like the one with the melty cheese the best. Your sarnie is EXACTLY what I should have had for lunch. Instead I had a soggy bagel with smoked salmon and NO cream cheese. And it rained. Which has nothing to do with lunch, but it wasn’t a good day and I want that sandwich. This looks so fresh and beautiful. Oh my that looks so fresh! That is what I want for lunch today! Great idea to grill it too. So simple and delicious Kevin… I recently buy Turkish flat bread and toast it, then spread a little bit of butter and top with mature cheddar shavings… 😉 But mozzarella, tomato, basil are one of my favourite combinations… Must try to grill it next time. Anything with the caprese taste combo is bound to be good! kevin, this sandwich looks anything but boring! I’m trying to lose my vacation pounds (I’m not fat but that isn’t the same as being thin, is i?) so I’ve been laying off the bread. The picture of this sandwich could send me tumbling off the wagon, though. That first picture is just gorgeous! I now know what I’ll be picking up at the Farmer’s Market tomorrow. That looks SOOO yummy! Beautiful! Thank you this recipe really rocks.